Billy Batson (Asher Angel) is a teenage foster kid who is gifted the ability to turn into adult superhero Shazam (Zachary Levi) when he says the magic word of the title. You can take a look at Batson (in the form of his supersuited alter ego Shazam) in the exclusive images below, courtesy of our sister publication Total Film magazine. Here Shazam faces off against his nemesis Doctor Thaddeus Sivana (Mark Strong) and hangs out with his friend and foster brother Freddy Freeman (Jack Dylan Grazer). With standalone superhero movie Aquaman currently storming the worldwide box office, the DC Extended Universe’s next film is already on the horizon, and like Aquaman, it has fun at the top of its agenda. Shazam! will introduce moviegoers to a new a hero from the DCEU, and will do so with a childlike sense of wonder. Not least because the lead character is actually a child. Billy Batson (Asher Angel) is a teenage foster kid who is gifted the ability to turn into adult superhero Shazam (Zachary Levi) when he says the magic word of the title. So imagine the Tom Hanks movie Big crossed with Superman, and you get the idea. In the film, Shazam will have to come to terms with his powers in order to stop Sivana… if he can get serious and stop enjoying the fun aspects of being a superhero for long enough, that is. 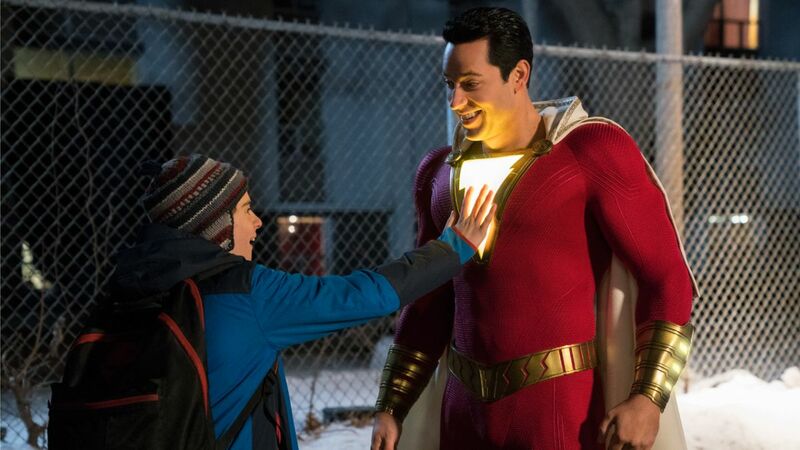 If there’s ever been a superhero who’s really going to enjoy their powers, it’s Shazam, and hopefully that joy is going to shared by the audience. Shazam! opens in the US and the UK on April 5, and you can read much more about it in the new issue of Total Film magazine, which hits shelves this Friday, January 11. For much more from Sandberg, Levi, Strong and co, plus on-set access, check it out. If you’re a fan of the mag, why not subscribe so that you never miss an issue? If you sign up, My Favourite Magazines will deliver every new issue through your letterbox before it hits shelves, and as well as getting it early, you’ll also save money on the cover price. And, on TF’s current subscriber offer , you could get a Funko x Playmobil Marty McFly collectible and an ’80s bookazine free when you subscribe for as little as £17.50 (Ts and Cs apply). What are you waiting for?